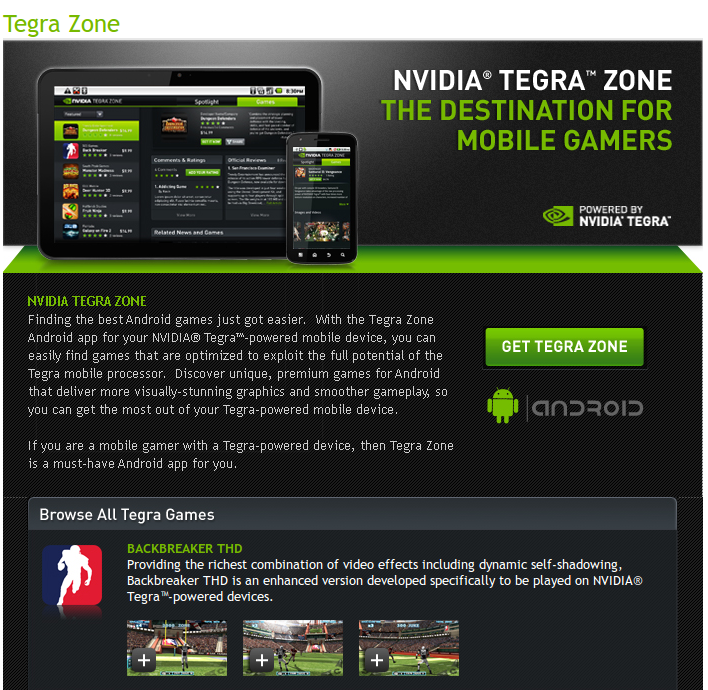 NVIDIA has today announced the release of the official NVIDIA Tegra Zone app for Android devices. The users of mobiles and tablets packing an NVIDIA Tegra 2 processor can find games optimized for them via this app. The new Android app is already available for download via the Android Market. The company announced that through this Android app, it would be easy for users to hunt down richest games for their devices. The app is available as a free download in the Android Market and would be offering a selection of games, made especially for Tegra processors. The app would also provide reviews, screenshots, trailer videos and so on. The games would be made available for purchase via the Android Market. Dungeon Defenders: First Wave Deluxe HD, the first Android game build using the Unreal Engine 3. Samurai II: Vengeance, and Galaxy on Fire 2 THD. Backbreaker THD, by Natural Motion. Fruit Ninja THD, by Halfbrick Studios. Vendetta Online, by Guild Software. Monster Madness, by SouthPeak Games. Hardwood Solitaire IV, by Silver Creek Entertainment. You can learn more about the Tegra Zone app on the company’s website.